We have arrived in Puerto Penasco, Mexico. 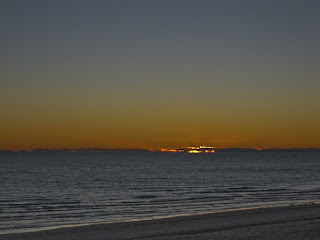 For the next month we will be staying at the Playa Bonita RV Park , which is right on the Sea of Cortez. We enjoyed a beautiful sunny day as we made the short drive down from Ajo today. Earlier this week the weather was not so nice. 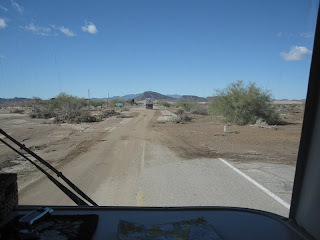 We left Quartzsite on Wednesday because we heard a storm was approaching and the weather was going to get bad. We arrived in Gila Bend late that afternoon. The first RV park we wanted to stay at was already full, but the second one we checked at had room for both of us. Thursday morning it was raining and windy as we drove up to Buckeye/Goodyear to finish up our pre-mexico shopping. Thursday evening Bob and Linda had us over for dinner to celebrate Judy's birthday. We enjoyed a great chicken dinner and chocolate cake while the coach was swaying and the rain came pouring down. The power at the RV park went out that evening, and Bob's weather station recorded a 51 mph gust of wind. It was wild weather. Friday morning arrived with partly sunny skies, so we packed up and headed south to Ajo, AZ. We needed to pick up our mail and Bob and Linda needed to pick up their insurance for Mexico. At one point during our short drive to Ajo, we were entertained by a group of A10 warthogs doing practice bombing runs at the Barry M.Goldwater Air Force Range. 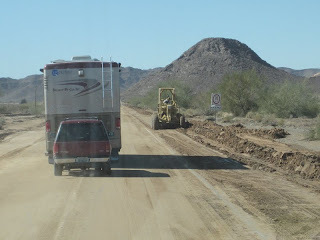 Shortly after we got settled into our sites at the RV park in Ajo, Bob heard air coming from one of his RV's front tires. He discovered a large bolt stuck in the tire. A few phone calls later and Coachnet had arranged for a tire to be sent down this morning from Phoenix. The tire repairman arrived at 9am. the tire was replaced, and we were on the road by 10:30. 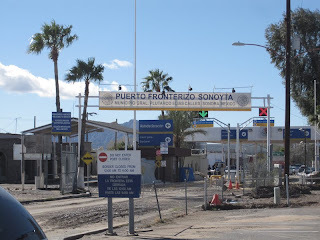 The road to Puerto Penasco was covered by mud in several places from all the rain, but we made it through without any problems. As this was Bob and Linda's third time driving down here we just relaxed and played follow the leader. This evening we walked up to a restaurant on the edge of the RV park and had a wonderful dinner. 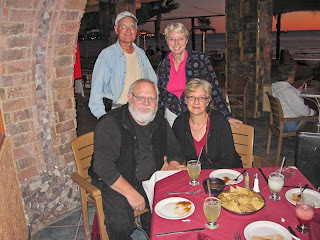 We enjoyed margaritas, calamari, shrimp fajitas, chicken enchiladas with mole sauce, and chili rellenos. 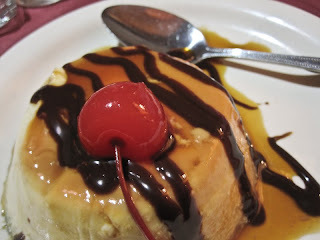 Yes, we even had room for dessert and we all had flan. 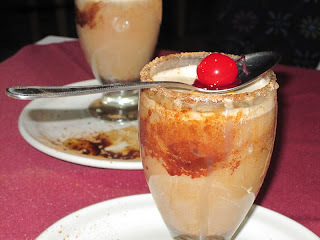 The waiter asked if we wanted coffee and Judy and Bob opted for the Mexican coffee drink. 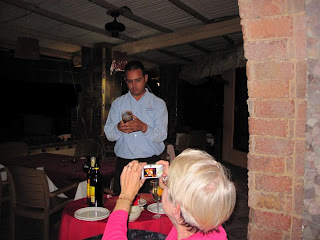 Prepared table side, it was as much fun to watch the waiter prepare it as it was to drink it. After a leisurely stroll back to the coaches , we played a few games of Mexican Train. Bob was on a winning streak, he won 3 out of 4 games. A great way to end our first day in Mexico.